aShortChronicle has learned that Defendants in the Griffith Street Hotel lawsuit have given notice they plan to appeal the court order handed down by Judge W. Robert Bell nullifying the rezoning decision allowing the project. No details are available at this point as to exactly what will be appealed. The notice from Roy Michaux, the attorney for the developer and land owner, simply indicates that an appeal is on the way. Defendants will submit a brief at some point in the near future with the details of exactly what they are appealing. Then, the Plaintiffs will have a period of time to respond - likely 30 days. At some point after that, this will be heard by the NC Court of Appeals in Raleigh. This update was received in a conversation with Luke Charde on Thursday. Charde is the lead plaintiff in the case. Here is what is known at this point. In the Order submitted by Judge Bell on July 9th, it indicates the Developer and Land Owner defendants instructed the Court to assume the Plaintiffs had standing for the motions being heard at the May 22nd hearing that resulted in the Order. The Order also states that "as a result of the Town of Davidson's failure to comply with applicable procedural requirements, the Rezoning...is hearby declared invalid and void ab initio, and the zoning immediately prior to the Rezoning shall remain in effect." Ab initio is Latin for "from the beginning", or in this case it means as if the Rezoning never happened. In practical terms, what the Order means is that to build the hotel, the project would have to go back through the rezoning process, and the Town would actually have to follow its own rules - rules the Town acknowledged in court filings it did not follow correctly the first time. The fact that the defendants would rather appeal this in Court than go through a process that simply follows the rules says quite a bit. Regardless of how this case ultimately turns out, it has already revealed how flawed things were at Davidson Town Hall when it came to Town Staff's handling of this matter. To date, nobody has been held accountable for that. When aShortChronicle started in 2011, there was really no expectation it would go on this long. Yet, here we are more than 7 years later, and post 1000 is now in the books. It has been a long and sometimes strange trip, but one I wouldn't trade for anything. Over the years I've learned a lot of lessons. Never hit the "publish" button if something might benefit from sleeping on it. Always trust your gut. If your gut says something will keep you up at night if you do nothing, then do something. Persevere until something unexpected happens. The last one may be the most important when it comes to explaining the level of "success" as gauged in page views achieved by this blog. It's sort of a personal version of The Stone Cutter's Credo - keep hammering away until the rock splits. To explain, take a look at the below chart that shows page views by month for aShortChronicle. 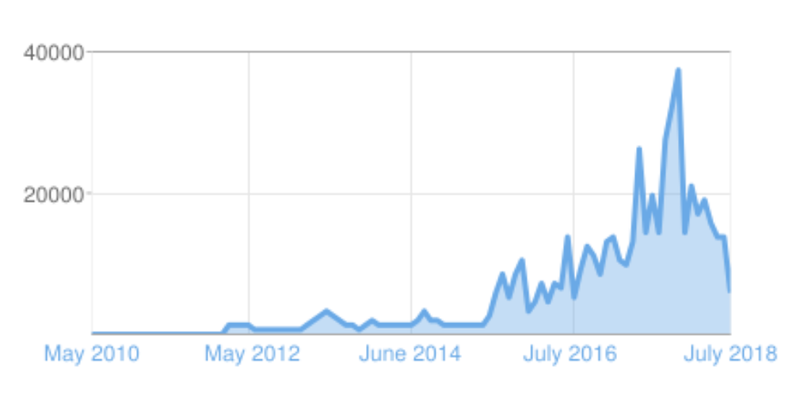 This chart represents more than 545,000 page views since the blog's inception, but as you can see it wasn't always running at the numbers it is now. For the first half of the blog's life, readership was minimal. Only a few political junkies, town staff, and elected officials would be counted as regular readers. Then, the first unexpected event happened. At the end of May 2015 DavidsonNews.net suddenly closed up shop. That started the upward trend in the graph. People wanted online information and DNN had boasted of 100,000 regular distinct readers. While web readership stats are dubious to calculate accurately, surely a chunk of those former DNN readers made their way to aShortChronicle more regularly. Also, as a result of the Town of Davidson losing its "paper of record", around that same time aShortChronicle began receiving and publishing Town press releases. The second unexpected event was the rise of Save Davidson. While yes, there is a core group of Save Davidson activists, that group has created what amounts to a movement that goes far beyond just a few people. With more than 2200 members on Facebook, Save Davidson has created an interactive platform that makes it easy to get involved in the community. It also provided a rich source of readers interested in Davidson Town Hall specific stories - just the kind of stories aShortChronicle specializes in putting out regularly. Take a look at the graph at May 2017. Save Davidson was still called Save West Davidson's Tree Canopy at that point, but already had hundreds of regular group participants. That was also the first month aShortChronicle broke 20k page views. That month saw stories on the Lake Davidson rezoning and the now famous Town Hall showdown between Ralph Clontz and Rick Kline over the sale of the Beaty Street Property to the Town. 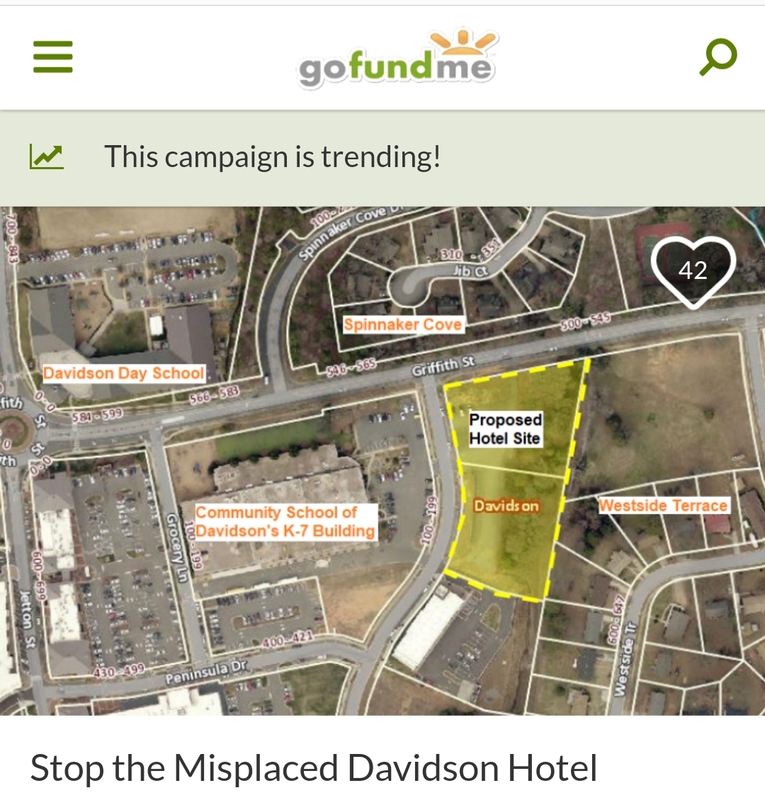 Neither of those stories which are still two of the biggest in this blog's history would have happened if not for the Save Davidson community. That credit to Save Davidson includes both the content of the stories through people met on the platform and the platform itself to distribute them. The rest of 2017 shows readership continuing to rise through election season, then tail off. If there is a lesson in the low readership of the current month its that this is a "what have you done for me lately" and cyclical kind of endeavor. This month has seen the least number of posts for a month since January 2017 (before the graph began its 2017 march upward), and that slow level of posting is also occurring during the summer when people tend to pay less attention to political issues. That combo equals far fewer page views, but it also means it's been a good time to take a much needed break. If you are a regular reader wondering about the lack of activity the past several weeks, that's all it means. When summer ends expect things to ramp back up. This strange trip isn't over yet. In the next 1000 posts, there are too many more interesting stories to tell, interesting people to meet, and certainly more interesting and unexpected events over the horizon. Who would want to miss those? The town is part of a growing movement of North Carolina municipalities that are taking transparency to a new level on the ClearGov platform, which also showcases basic profiles of every municipality in the state. Davidson has added detailed revenue and expenditure breakdowns of its general fund data. 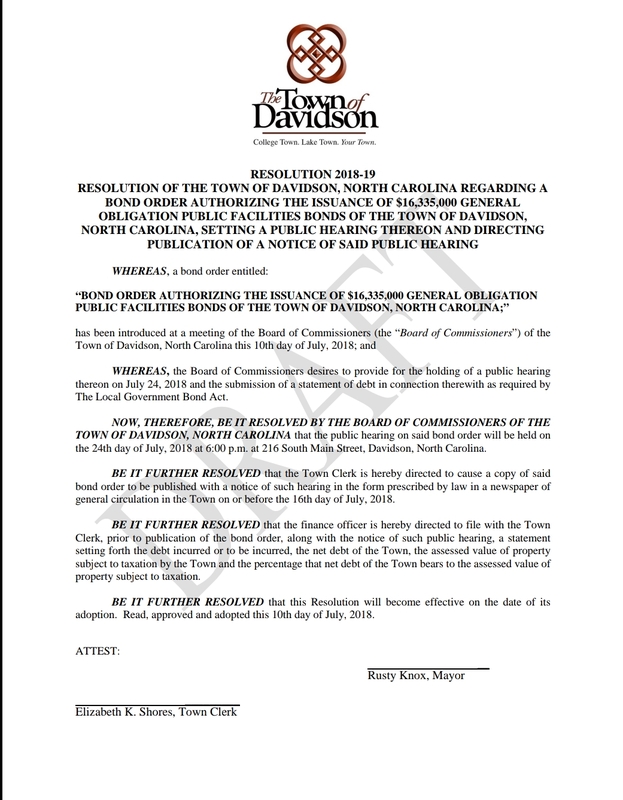 “We are excited to partner with the ClearGov platform and encourage Davidson citizens to take a look,” says Finance Director Pieter Swart.“We anticipate that using the ClearGov platform, in conjunction with our other transparency efforts, will enhance citizens accessibility to, and comprehension of, the town's finances." ClearGov helps local governments communicate and operate more effectively and efficiently through a unique fiscal clarity and insights platform. Local governments leverage ClearGov to more clearly communicate their financial performance in an effort to build citizen trust and participation through transparency. ClearGov also provides valuable municipal benchmarking intelligence to help government leaders quickly compare their finances against similar communities to make more informed and data-driven policy and budgetary decisions. As the plan for putting a $16 million GO bond on the ballot plods forward, Davidson Town Hall is ramping up the sales machine for a new Davidson Town Hall. With two events planned for this week citizens will be able to get more information on the projects to remake the old IB Middle School on South Street into a new Town Hall and CMS offices and to upgrade public safety facilities in the current Town Hall on Main Street. Thursday, July 19 from 5:00 to 7:00 p.m.: Open house and ice cream social at the former IB school located at 215 South Street. The public hearing on whether or not to put this to a vote in a November referendum will be next Tuesday, 7/24 with the final vote to put it on the ballot on 8/14. If this does make it on the ballot the Town will have to be careful that these types of events don't cross the line into "promoting" bond approval. That would be prohibited. However, for now these events are within bounds. Citizens should take these opportunities to learn about these projects which will impact town finances for years to come. Then they can decide if they are worth the cost. 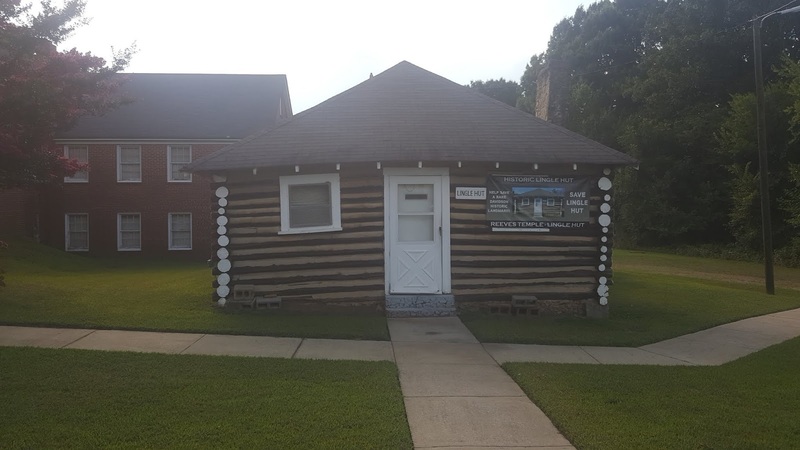 aShortChronicle previously told readers about the effort to restore the "Lingle Hut" at Reeves Temple AME Zion Church on Watson Street in Davidson. That effort has now moved into a serious fundraising phase with a series of meetings set for every other Thursday at the Davidson Library. 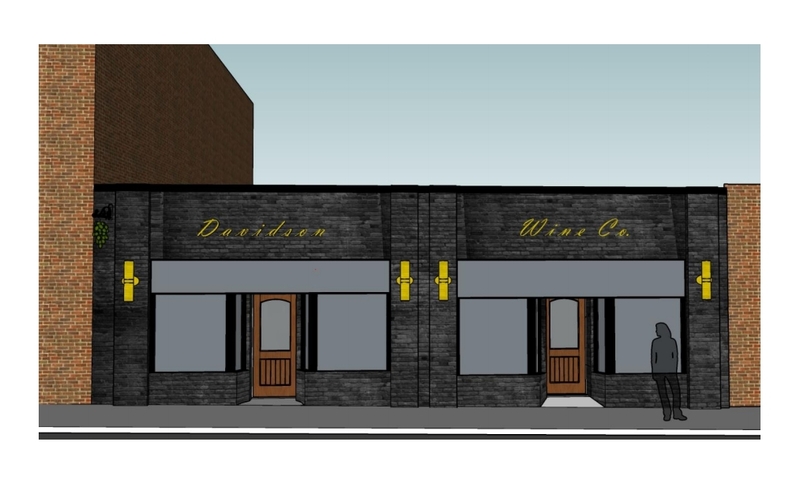 As this project moves forward, it provides an opportunity to showcase a bit if history here in Davidson through the stories that can be told surrounding this building. There is no place better to start those stories than with Castella Conner, Trustee Chair of the church. In fact the story of why the building is called the "Lingle Hut" starts with Conner's family. aShortChronicle caught up with Conner at Reeves Temple Monday evening as she was preparing for an evening session of Vacation Bible School. The children attending VBS used to meet in the Lingle Hut until it fell into disrepair. Connor says they now use the basement of the church. The story of how the church's meeting space came to be called the Lingle Hut begins with the Conner family's connections to Davidson College. Both Castella Conner and her brother work there. Their parents were long-time employees as well. Castella's mother Cecilia Conner and her father Talmadge Conner Sr worked for Davidson College for about 30 and 40 years each. Cecilia Connor passed away last year at 100 years and 5 months of age. But, back in the 1960's while at the College she read regularly to Merle Lingle, wife of College President Walter Lingle. Merle Lingle was bedridden at the time. Through that relationship Cecilia Conner let it be known that her church congregation was in the process of trying to buy the property on Watson Street. A generous donation from Ms Lingle's son was able to put that fundraising effort over the top, and the Reeves Temple congregation moved into the church on Easter Sunday 1966. As part of receiving the donation, the church renamed the structure used for fellowship as "The Lingle Hut". Now, more than 50 years later the Hut is in need of significant repair to restore it to life - to allow it to once again be used for things like Bible School, dinners, Christmas festivals and more. The effort to restore the building starts with repairs to the foundation. Those are estimated to cost roughly $20,000. Nearly, $9,000 has been raised so far, so the effort is well on its way. If you are interested in getting involved and helping bring back some Davidson town history, stop by the Davidson Library this Thursday at 630pm. A group of church members and other citizens will be holding planning meetings there every two weeks to get this project off the ground. The transformation of Davidson's Main Street continues, this time with a proposed wine store in the empty storefronts on Depot Street. aShortChronicle reached out to the project team this past week to see if more detail was available, but did not get a response. LaBella Associates is the firm submitting the Design Review Board application for facade changes. The project goes before the DRB this Wednesday, 7/18. As mentioned in the previous post, Davidson Commissioners will consider on Tuesday moving forward on a possible November GO bond vote for public facilities. The numbers are big. $16.335 million to be exact. However, the tax rate implications to fund this project are less specific. Since GO bonds are paid using property taxes, binds almost always equal property tax increases. 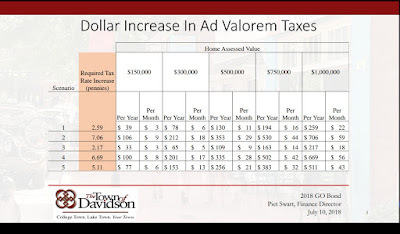 Those tax rate increases will depend largely on how valuable your house is now, how much it will be valued after the 2019 revaluation, and how much of that increase Davidson Town Hall decides to "". Davidson already has by far the highest property tax rate and solid waste fees of the North Mecklenburg towns. 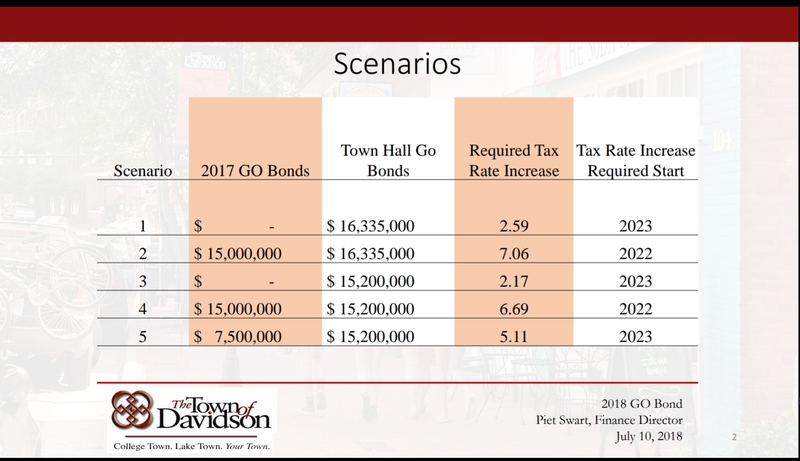 The proposed public facilities bonds along with the bonds passed last November have the potential to raise taxes significantly. 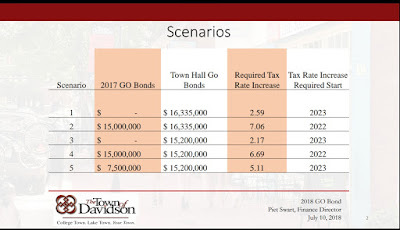 The scenarios in the below chart show the combined effects of these bonds on Davidson's tax rate. The smaller smaller $15.2 million used in scenarios 3-5 appears to be after there was some nibbling around the edges on reducing costs. 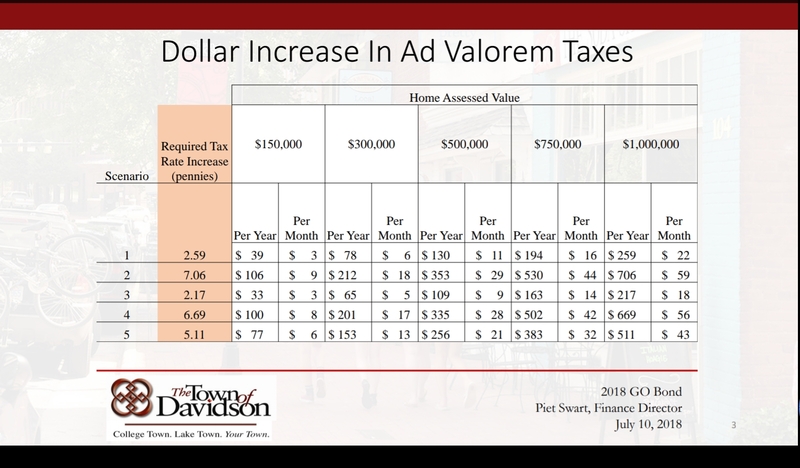 The second chart shows the property tax impact based on home values. At last month's Davidson Board meeting, Commissioners got the first public glimpse of cost estimates for proposed Public Facilities expenditures to remodel the old Davidson IB Middle School building and the existing Town Hall for Town use. The numbers were eye popping. There was much public hand wringing around the dias at the costs of more than $16 million. There was discussion on how to trim the number. There seemed to be some genuine concern for the tax implications of spending this amount. However, on Tuesday Commissioners will consider moving forward on just that. A "draft" resolution is included in the agenda that seeks to move a GO bond of $16,335,000 to the next step of the process towards a November vote. That number is actually a bit larger than the numbers presented last month. Most likely that is due to including issuance costs for the bonds in the bond amount as well. It also shows that no serious cost trimming was attempted after the public display of concern last month. Moreover, the entire amount in the draft is in a single bond proposal with the Public Safety and Town Hall money in a single bond. This leaves open the likelihood of leveraging needed public safety improvements to get wanted additional Town Hall space for staff. It is hard to see this proposal getting public support when presented this way, but that appears to be where the town is headed.